In this landmark new study of Western thought, Anthony Gottlieb looks afresh at the writings of the great thinkers, questions much of conventional wisdom, and explains his findings with unbridled brilliance and clarity. 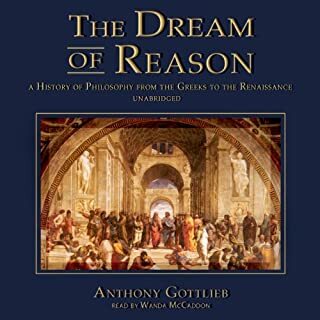 After finishing The Dream of Reason, listeners will be graced with a fresh appreciation of the philosophical quest, its entertaining and bizarre byways, and its influence on every aspect of life. A cogent list of the history of philosophy, told in an entertaining and neutral manner. Fair overview of many prominent figures in the history of the study, not tainted by philosphizing. We have more exposure to media than ever before and the barrier to entry on published information has never been lower. 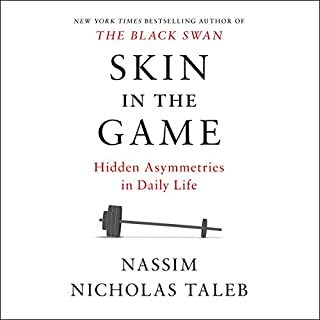 This book is the most effective operating system I have found on the navigation of the newest iteration of public life. Who should we listen to? Whose opinion should we take into consideration? What risks are worth taking? What ethically can I do to bring Good to the world (or better, avoid harm of others)? We all need more symmetry in our lives. Relationships, investing, risk taking, regulation, sharing of advice and opinions publicly. SITG guides what we can in good conscience add to the world. Or at least follow The Silver Rule. People are now exposed to more information than ever before, provided both by technology and by increasing access to every level of education. These societal gains, however, have also helped fuel a surge in narcissistic and misguided intellectual egalitarianism that has crippled informed debates on any number of issues. Today, everyone knows everything and all voices demand to be taken with equal seriousness, and any claim to the contrary is dismissed as undemocratic elitism. 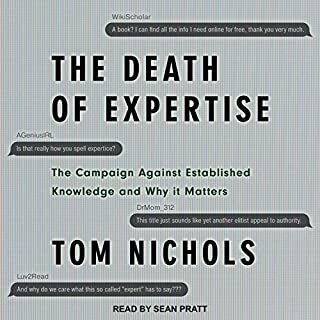 I expected a book on why the effectiveness of “expertise” is dwindling. Instead I was bombarded by pseudo-intellectual groupthink on why the public is stupid, academics are experts and we should submit to their expertise blindly. While the majority of academia strays further and further from rigorous critiquing and closer to groupthinking echo chambers, the author in essence asks ‘why doesn’t the average person follow the guidance of the ivory tower?’ If an expert is not accountable to the public/reality, and is only accountable to his peers, books like this are published. 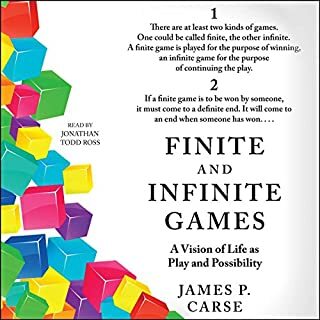 Education (especially among the humanities, history, social sciences) is decentralizing and well-meaning but misguided “Experts” wonder why the public doesn’t think they have all the answers. Production was fine, the author had a fine speaking voice. Otherwise avoid unless you’re looking to fluff your confirmation bias on the value of anointed experts.